Hi. 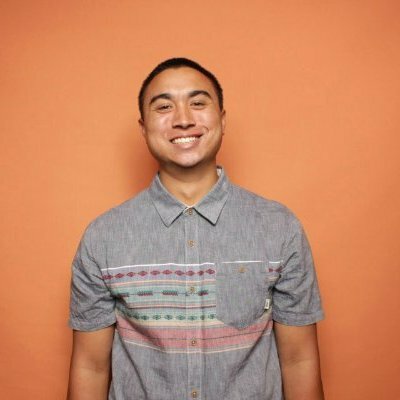 I'm Nick, and I'm new to the HubSpot Marketing Blog. But I'm not new to HubSpot. 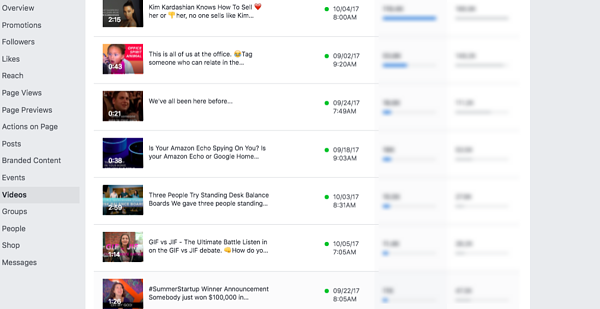 I've been working at HubSpot for over a year now, and in that time, I've created more than 50 videos for HubSpot's Facebook page. And over the last year, we've grown our organic Facebook video views by nearly 250%. 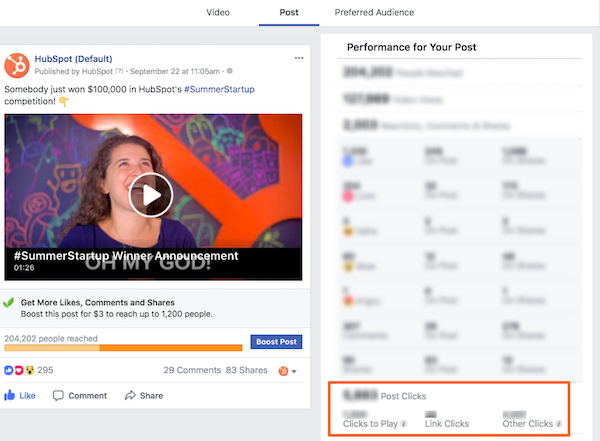 We used a lot of different content creation strategies to change our approach to Facebook videos, and knowing specifically what to track -- and why -- was a critical part of measuring our success and growth. 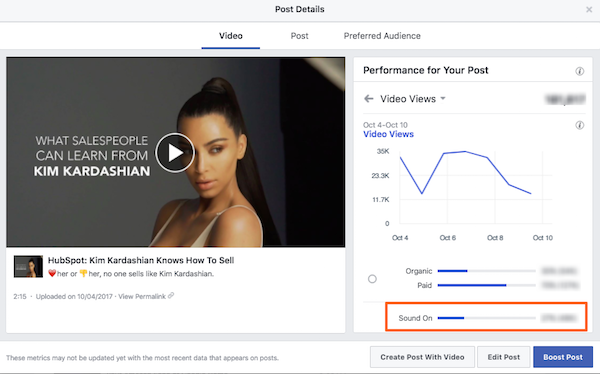 Enter Facebook Videos Insights: Facebook's metrics panel that tells you anything and everything you'd want to know about how your videos are performing on the platform. In this post, I'll take you through why you should be creating videos for Facebook (if you aren't already), what the different metrics mean in Facebook Insights, and which five metrics are the most important to measure. And if you don't have time to read the whole blog post, watch our short video about the five metrics we recommend measuring most. At more than two billion users, Facebook is used by almost one-third of the world's population. That kind of audience isn't anything to sneeze at, and you should take advantage by publishing video content on the platform. What's more, Facebook users spend more than 100 million hours per day watching videos on the platform -- almost as much as Netflix. Facebook has a huge audience that's engaged in video content consumption -- so why wouldn't you post videos on the platform? 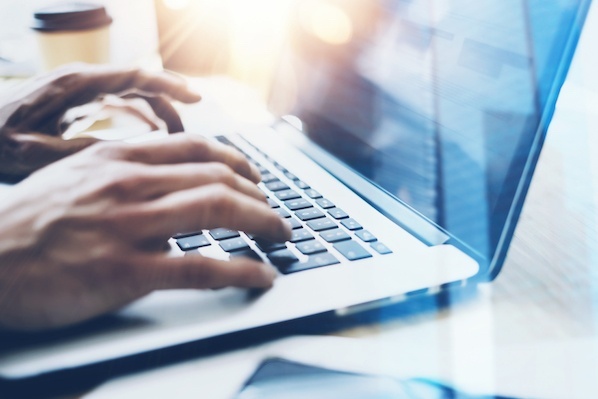 The algorithm that dictates what content is served up in users' News Feed heavily favors video content -- especially if it's produced live, or if a lot of users are engaging with it (more on that later). 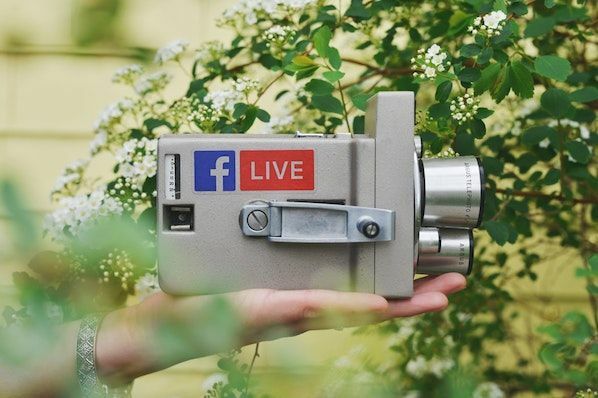 Videos on Facebook are more likely to get surfaced to users unfamiliar with your content -- thereby growing your audience and leading to more video views. It's easier than ever to create and publish video content on Facebook. You can start broadcasting using Facebook Live with the press of a button, and you can even record high-quality videos with a smartphone. With numerous free editing software options and a video camera in your pocket, there's no reason to wait to start filming for Facebook. To access these metrics, navigate to the "Insights" tab on the Facebook Page you manage. From this tab, scroll down to the "Videos" section on the left-hand side, and click on the video post you want to analyze. "Video views" represents the number of users who watched your video for three seconds (or more). This metric is the number of users who watched your video for 10 seconds (or more). This number is typically smaller than the number of three-second video views, but ideally, the number is close -- indicating that users started watching your video and stayed for at least seven more seconds to keep watching. "Minutes viewed" is the total amount of time users have spent watching your video (in aggregate). This metric is the average amount of time each user spent watching your video. It's calculated by dividing the total minutes viewed of your video by the number of video views. "Average percent watched" represents what percentage of your video the average user watched. 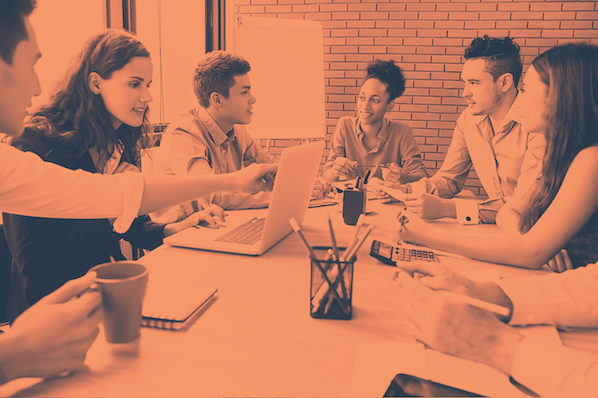 "Audience retention" represents how well you're able to maintain your video's audience by visualizing where during your video viewers dropped off. "Reach" represents how many users saw your video somewhere on Facebook -- in other words, how many users your video reached. 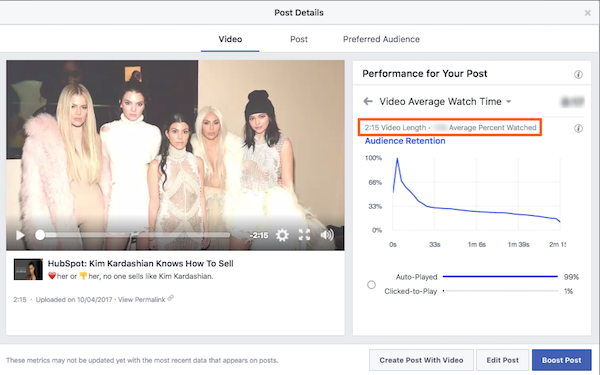 Your video's view rate isn't a metric provided by Facebook, but it's a good number to calculate on your own. Divide the number of video views your video earned by the total reach. That will indicate how many users actually decided to watch your video, out of the number of users who saw it. Last month, Facebook began auto-playing News Feed videos with sound, so we'll be interested to see how this percentage evolves. Here at HubSpot, we've started creating videos that are volume-agnostic, or indicating with captions and graphics that the user should turn on the volume to get the full effect of the content. This engagement metric includes likes, reactions (like anger, sadness, and laughter), comments, and shares of your video. These are indicators that your video is resonating with -- or at least provoking -- your audience, and this engagement helps your video rank higher in the Facebook News Feed algorithm. The "clicks to play" metric indicates the number of users who clicked on your video to watch it. The "link clicks" metric indicates the number of users who clicked on the link in your Facebook video post. 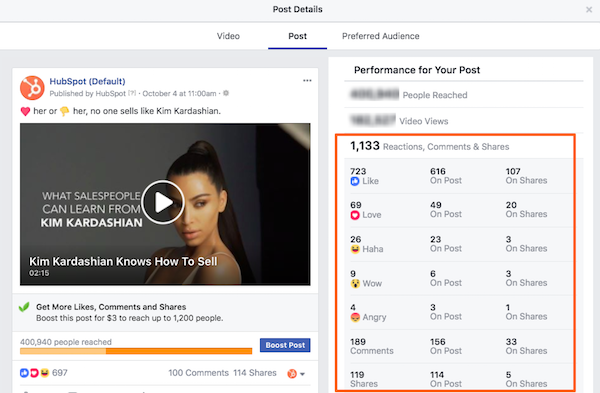 Since Facebook started down-rating posts from brands and publishers in the News Feed, make sure you're optimizing your organic reach by posting on Facebook no more than three times per day. This metric represents how many people are watching your video relative to your total reach, and it tells you how relevant or catchy your topic is -- or if it's not resonating with your audience. This is the ultimate engagement metric, and it's another measure of relevancy. As a bonus, shares earn you more organic reach when you get free exposure to users' friend circles. This metric tells you how engaging your video is. What's more, Facebook cares about this metric and provides greater organic reach for more engaging videos in the News Feed. So, there you have it. Make sure you're focused on the right metrics -- and not just vanity metrics -- when you publish your next video on Facebook so you can keep iterating on what works to better engage with your audience.